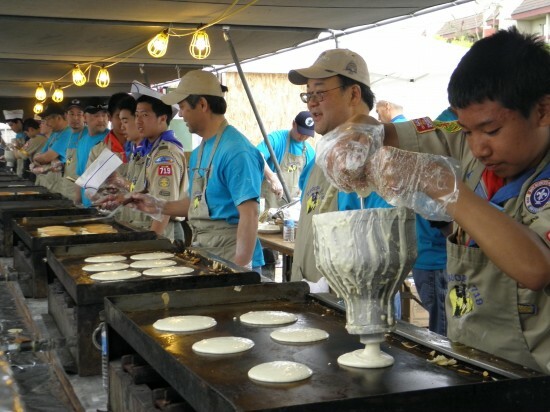 GARDENA — Boy Scout Troop 719, sponsored by Faith United Methodist Church in Torrance, held its annual Pancake Breakfast on Sunday at the Gardena Valley Japanese Cultural Institute. According to Scoutmaster Jerry Tondo, about 1,917 meals were served from 7 to 11 a.m., with the busy scouts and parents averaging nearly 480 meals per hour. No word on how many pancakes were produced. 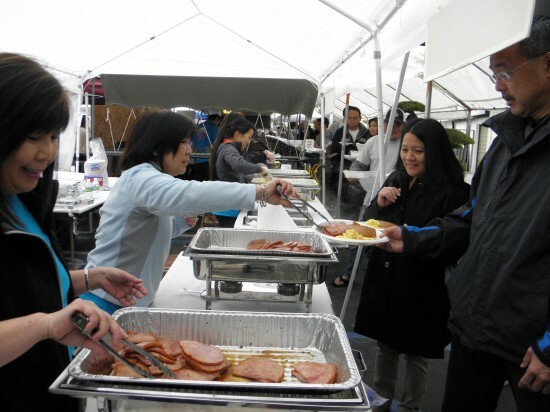 The JCI hall was filled with people socializing as they dined on pancakes, ham, scrambled eggs, coffee and orange juice. Take-out was also available. The weather cooperated — a heavy downpour started after the event was over. The coordinator was Dr. Rouxann Kuwata. Troop 719 also thanked Alison Kochiyama, executive director of JCI, and Debbie Oba, managing director, for the use of the facilities. The Pancake Breakfast is the troop’s biggest fundraiser of the year.